The best escape into the woods at Hartwick Pines is the Au Sable River Trail on the west side of MI-93. 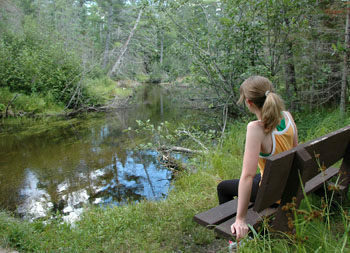 The highlight of this 3.1-mile trail is the East Branch of the Au Sable River, which it crosses twice, but the route also winds through its own stands of virgin timber and passes 23 numbered posts that accompany an interpretive brochure available from this web site or at the Michigan Forests Visitor Center. Best of all the crowds that gather around the towering white pine along the Old Growth Forest Trail are rarely, if ever, experienced here. The Au Sable River Trail does require a bit of climbing at one point and a few wet spots must be crossed; but overall the trail is not difficult and can easily be hiked in lightweight walking shoes. It also serves as an access for anglers, who enjoy the challenges of fishing small trout streams. AuSable River Trail is marked on the north side of Bobcat Trail and begins as a level path that enters the pines and quickly moves into a red pine plantation. Within a quarter mile at post No. 3 you reach the junction with the return loop. Continue straight to follow the loop in a counter clockwise direction to follow the posts in the correct numeric order. The trail crosses a two-track, then a power line before arriving at a foot bridge across the East Branch of the Au Sable River at Mile 0.6. Interpretive Posts 7 and 8 are located here. There is also a bench, and if you sit quietly for long enough, you might see the rings of rising trout dissipate down the stream. The East Branch flows 16 miles from its source to the southwest and into the main stream of the Au Sable River, the most famous trout stream east of the Mississippi. In Hartwick Pines, the East Branch is especially scenic, a crystal clear stream that gurgles between gravel banks and through cedar swamps and undercuts the banks around deadheads. Too narrow to be a good canoeing waterway, the stream ranges between 15- and 20-feet wide in most places and holds a good brook trout fishery that is overlooked by many anglers. From the bridge, the trail swings north and moves away from the stream and into a mixed forest of white, red, and jack pine. A few of the pines are notable large. The trail arrives at the second bridge across the East Branch at Mile 1.3 and then enters a white cedar swamp on the other side where conditions can be wet at times not to mention buggy. 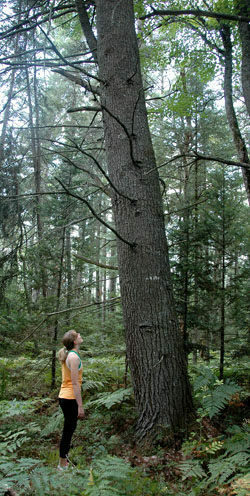 The best stand of trees, however, is reached at Mile 1.6 miles when the trail arrives at post No. 17, located in a cathedral of tall hemlock where there is little underbrush due to the lack of sunlight. This stand of huge eastern hemlocks towers above the trail, enjoyed today only because in the 19th century the market price of tan bark fell before they did. The low return on hemlock bark, which was used for tanning leather, no longer paid the loggers even to cut them. The relatively level walk passes underneath the power line a second time and arrives at a two-track that is posted “Alternative Route” that can be followed south (left) for those who want to bypass climbing the ridge. The trail, posted as “Overlook,” continues straight and is a pair of switchbacks that makes a steady climb to post No. 19, reached at Mile 2.1. The post marks the crest of a glacial moraine that is almost 1,300 feet in elevation and near enough to M-93 that occasionally you can hear traffic rumble by. There was once a scenic overlook here but saplings have long since filled in the view with foliage. A sharp descent from the ridge follows. The final leg of the trail is a level walk past a railroad grade of the Lewiston Railroad and a rectangular-shaped mound that many believe was a former barn in the area. The trail continues crosses a pair of two-tracks and at Mile 2.9 returns to the only junction on the route. Head right to reach the trailhead at Mile 3.1. There are no facilities at the trailhead of the Au Sable River Trail. Hartwick Pines’ main entrance is on the west side of M-93 and leads to the campground, park headquarters and the Michigan Forest Visitor Center. 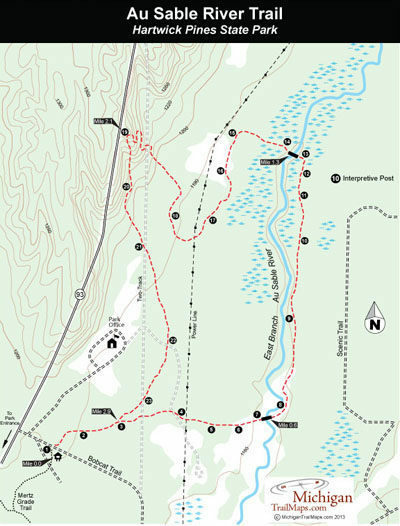 You can actually begin this hike at the interpretive center by hiking the Old Growth Forest Trail and a portion of the Mertz Grade Trail. For simplicity it is easier to start the Au Sable River Trail at the clearing where the old campground was located, a mile north of the main entrance at the corner of MI-93 and a dirt road called Bobcat Trail.